During their first look, we encourage couples to interact naturally with each other, and that can include reminding them to practice their first dance before they have to perform in front of a crowd. We believe that artistically documenting candid images of real moments is one of the most important aspects of what we do as professionals. Using longer lenses and staying far away from the action may increase our level of difficulty, but we feel the genuine reactions we see when couples forget we are nearby are well worth the additional effort. 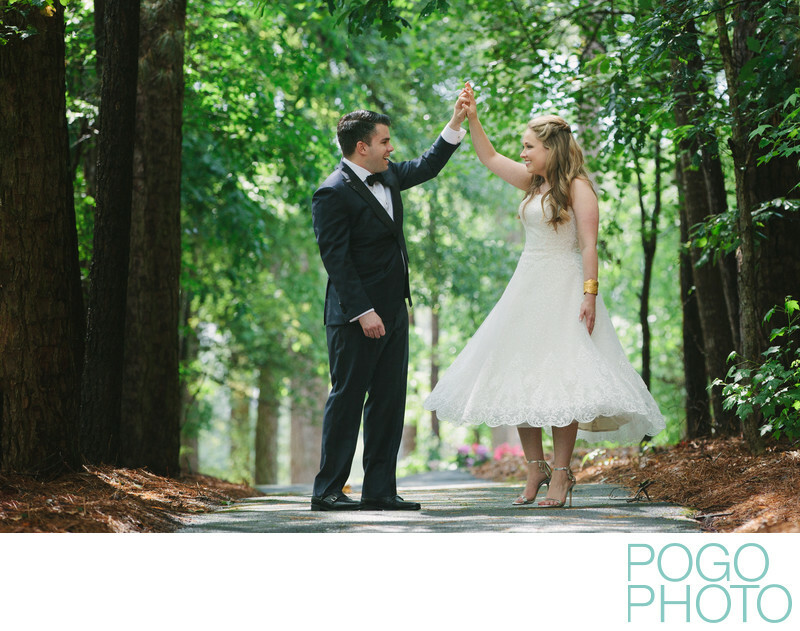 The couple in this image chose to do their first look outside, right after an intense rainstorm had passed through the Clemson area. The humidity was beginning to subside and the clouds had started to part, but the smell of the wet woods lingered in the air, which help give the illusion of being even further out into nature. The clouds also partially obscured the sun to help mitigate the otherwise dappled sunlight pouring down between the leaves. This combination helped create a very special moment for the two of them, and allowed us to hide behind a few trees and manipulate their line of sight to give them the feeling a private time, allowing them to behave completely naturally. First looks are an exhilarating, spine-tingling part of the day. This is one of the few times the couple has to be alone on their wedding day, and reunites best friends after spending the morning apart (if they chose to get dressed in separate places). Steve almost always places the groom first, since chivalry dictates that he can wait for his beauteous bride as she saunters into a specified spot for the unveiling. He also likes to ask them to describe their level of nervousness on a scale of 1-10. The answers just before seeing their other half have all been "seven", "eight", or "nine". When Steve asks the question a few minutes after they see each other and interact for a bit, the smiling response is invariably a “two.” This reply is frequently accompanied by a tight holding of the bride’s hand , a signal that subconsciously shows his level of comfort has increased immensely since seeing his partner and they can now experience the rest of their day together. First look locations can be as simple as a corner of a building, a doorway, or meeting across a courtyard, but seeing each other for the first time in a more natural setting like the woods can provide a great visual change up for indoor weddings. If transportation and timing align, first looks can happen in entirely different places than other parts of the day. If the couple is getting ready separately and traveling a fairly long distance to the ceremony, we can arrange to stop at a park, waterfall, or lakeside to orchestrate a memorable experience. Couples getting married near where they met may choose to have their first look at the exact spot where they met, had their first date, or got engaged. Location: Clemson Outdoor Lab and Kresge Hall, 415 Charlie White Trail, Pendleton, SC 29670. 1/400; f/4.0; ISO 500; 160.0 mm.